Learn how to use toggle switches to turn design elements on or off independently on your desktop or mobile design. As you've probably noticed by now, when you add design elements to one version of the design, be it mobile or desktop, they are added to both versions of the site design. These elements can be controlled almost completely independently and you can learn more about that here. This article will specifically show you the toggle switches which help you turn design elements on or off on the respective version of the site you wish to show or hide it on. As you can see in the example below, we have three elements on the "shapes" canvas, which are all shapes. 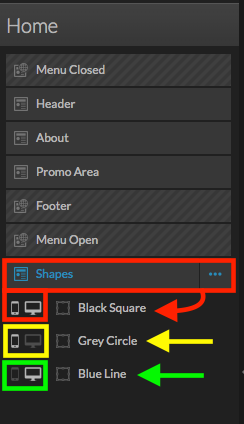 The black square is set to display on both desktop and mobile designs. The blue line only shows on the desktop version, and the grey circle only shows on the mobile design. The toggle switch settings to the left of the element layers in the let sidebar pictured below match what you see in the builder. It is truly that easy to customize your mobile and desktop designs by hiding or showing elements with toggle switches! Happy designing.